La Grande Roue de Paris must have been an awe inspiring sight. I look at the antique postcard to the right and wonder how it didn’t topple over. It was so big. This Ferris wheel was built for the Exposition Universelle of 1900 world’s fair in Paris, France and had a then world record diameter of 100 meters. 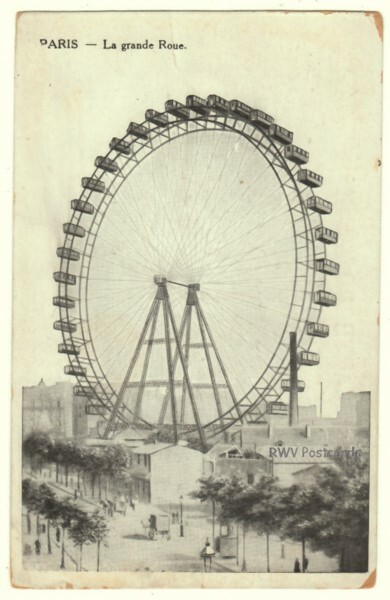 If you didn’t comprehend this Ferris wheel’s size from the diameter, the passenger car’s use as homes for French families in areas devastated by the World War (after demolition in 1920) should help. Part of the Exposition Universelle of 1900 was the Second Olympic Games. These games marked the first participation by female athletes in the Olympics. I found out something very cool. 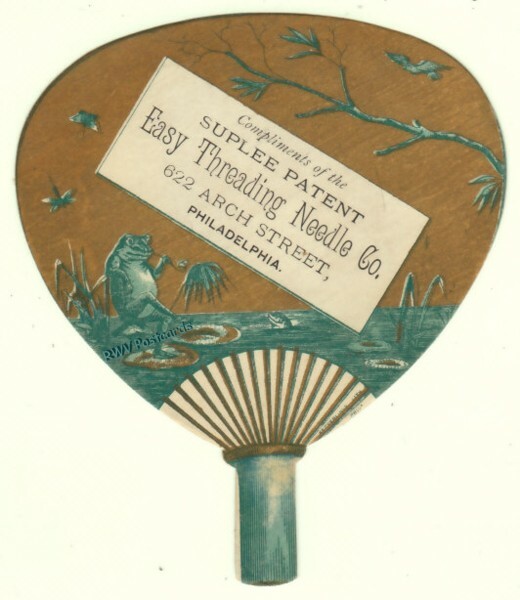 The inventor of the easily threaded sewing needle advertised on this die-cut fan Victorian trade card was a woman! I had assumed there were no women inventors at the turn of the century (how backwards thinking of me). Her name was Hannah G. Suplee, wife of a sewing machine salesman. Hannah was an inventor during a time when such an occupation was considered impractical for a woman. You see, inventions by women didn’t generally pay that well. Royalties and profits for many women weren’t realized. That is because they either didn’t file patents for fear of being viewed a failure if it was known a women was the brains behind the invention, or they sold it outright and cheap to a man who took advantage of them. Women that did file patents did so under their male lawyer’s name. Geez, the modern day women’s activist would have a field day with this situation. Hannah exhibited her inventions at the 1876 Centennial Exposition in Philadelphia. A few women inventors came away from that exposition an outstanding success. I couldn’t find out if Hannah was one of those women. Hopefully she made enough money off her inventions to escape the dire economic situation many women inventors faced. You can find many more Victorian trade cards with great graphics in my store, Remember When Vintage Postcards. ** If you liked this blog post and want to share it, click on the bookmark link to the right. How Well Do You Know Cupid? It’s always fun to learn an unimportant bit of trivia, remember it, and then drag it out at opportune times. 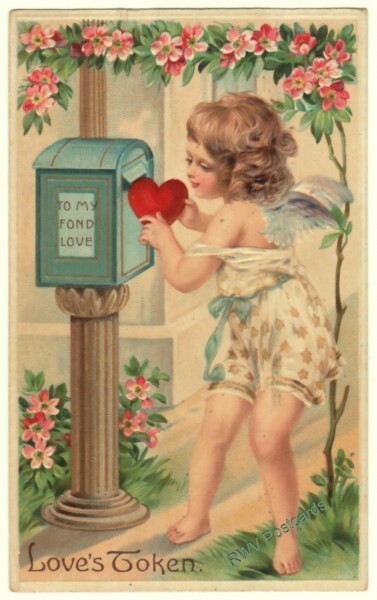 Cupid’s power was supposedly greater than his mother’s (Venus), and included dominion over the dead in Hades. It’s hard to believe such an angelic looking creature, associated with love, had such a power over something so dark and feared. Note: Marie over at The French Factrice blog is hosting Postcard Friendship Fridays. Have some postcards you want to share? Hop over to Marie’s and check out all the folks sharing this week. It’s been awhile since I blogged about a postcard message. This one makes me very happy I didn’t live around the turn of the century. “My Dear Grandpa & Grandma. How are you. we are all well. Papa killed by pigon, and I pulled one of my teeth monday morning. Come over when you can. From Floyd. I absolutely hate housework! Major Yuk. Having to put up all the carpets (translation, clean them) constitutes housework. Thank God for today’s carpet cleaning services. Wonder why Papa killed his son’s pigeon? ** If you liked this blog post and want to share it, click on the bookmark button to the right. Hummm. This is a strange one. 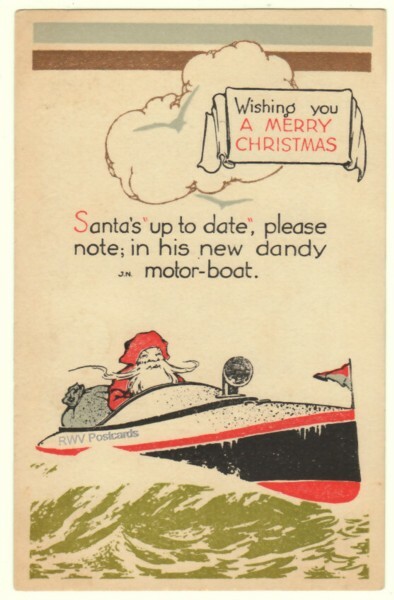 Santa Claus is not only in a motor boat, but riding it in GREEN water! It probably matched the muted colors on this vintage Christmas postcard better than blue. Still, a motor boat is quite unusual on a postcard. I decided to look into the various modes of Santa Claus transportation. Many attribute Santa Claus’ beginnings to a 4th century bishop in Turkey. This bishop, Saint Nicholas, walked when placing presents in children’s shoes. As his legend grew, so did the kids to be reached with presents. Saint Nicholas’ mode of transportation had to change to answer the question, “How does Santa deliver presents to all the children in one night?” Walking would not answer this. The Dutch of New Amsterdam (New York) brought Sinter Klaas (Saint Nicholas) to America via a legend that included him riding a white horse. In Washington Irving’s 1809 book, A History of New York, he also used a horse. The book was revised in 1812 to show Saint Nicholas riding over the trees in a wagon. The Mailick green Santa Claus from my Antique Postcard Artist Alfred Mailick – Odd Subject blog post is another example of odd transportation (donkey) for Santa Claus. I was not able to find a definitive answer as to when the sleigh began to appear. Note: anytime you find Santa Claus using transportation other than a sleigh pulled by reindeer on a postcard, the value will go up. How much will depend on the mode of transportation and rarity, but can range from $5-10. Feel free to look at other Santa Claus postcards from my personal collection on my web store’s gallery page. ** If you liked this blog post and want to share it, please click on the bookmark button to the right. 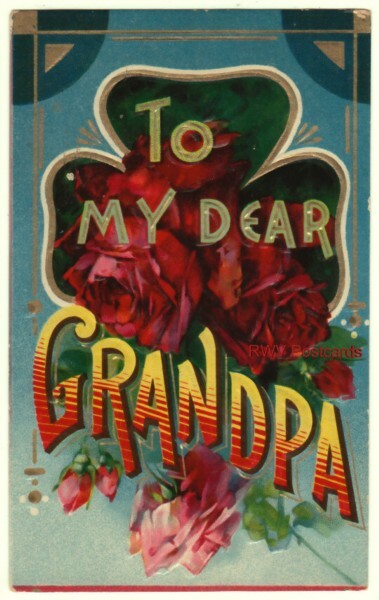 One tends to learn a lot when digging into the history behind a vintage postcard, or Victorian trade card. In this case, I learned about the break-up of a monopoly that had me remembering the break-up of Ma Bell (telephone) 25 years ago. (L&M) of St. Louis was started by John Liggett (who’s grandfather’s New Jersey snuff mill was burnt down by British soldiers) and George Smith Myers in 1873. By 1885, it had become the biggest producer of plug chewing tobacco in the world. Meanwhile, the Bull Durham Tobacco Company grew into the leading cigarette maker (and chief competitor of L&M) in the US. James B. Duke of Durham Tobacco, created the American Tobacco Company from five leading cigarette companies. After John Liggett died in 1897, L&M became part of the ATC. Makes me wonder what John Liggett’s position on the formation of the ATC was if James Duke couldn’t obtain L&M until after John’s death. A little over 10 years later, the ATC ran afoul of The Supreme Court. It found ATC guilty of violating the Sherman Antitrust Act (an act designed to prevent business monopolies) in 1911. As a result, the ATC was divided into four companies: the American Tobacco Company, Liggett & Myers Tobacco, P. Lorillard, and R.J. Reynolds (name sound familiar?). L&M was on it’s own again.